Odoo 12 Community Edition removed accounting module. Without accounting module, it become useless. Most importantly, can foresee more and more core modules will be moved to enterprise edition. Sooner or later, we have to switch to other alternatives. Do some study first. Will keep track of the movement and decide. ERPNext has a rolling-release model and includes migration scripts. Therefore you always benefit from latest enhancements and features but you need to ensure that your customizations stays in line with master and features can change from one day to another. Odoo has a more classical release plan : each version is supported for three years and only bugfixes seems to be allowed in a stable versions. That said, no migration script is provided (OCA OpenUpgrade project tries to handle this) and each major version needs an huge migration to be planned. Architecture : as already said, ERPNext goes to include many features, verticals too (already healthcare and education ones), that may be hidden after by customization. Goods points : coherence, quality and maintenance. On Odoo side, everything is very modular and you may only install contact management or project management on your database. But this can lead to fragmentation and testing complexities. Community and manpower : Odoo SA employs dozens of people on Odoo. OCA and community is composed by hundreds of contributors. There are many (thousands) of modules existing. Frappé / ERPNext community is smaller, but growing. Odoo is leaded by a company. Roadmap is not public and you can have surprises a few days before each new version. Odoo SA sells SaaS and services like implementation / development. It provides a partner program. Since 2015 and Odoo v9, there is an open source edition, Odoo CE and an enterprise proprietary edition, Odoo EE (that is Odoo CE + extra closed source modules). Migration code between major version is not open source, for many tears. OCA, Odoo Community Association, is a swiss non-profit foundation which coordinates open source community development, events… and manages quality software that enhances Odoo CE, add new features etc. ERPNext is now driven by a non profit Indian Foundation. Roadmap is public and openly debated. All the code is open source, migration scripts included. The foundation handles events, promotion… and has its own developers. Frappé Tech still dominates ERPNext work, as the foundation is young and the number of contributors still low (but growing). Frappé Tech mainly offer SaaS hosting and is not a direct competitor for service providers. Hope this is useful and quite objective. Feel free to amend / debate. Postfix is an MTA (Mail Transfer Agent), an application used to send and receive email. In this tutorial, we will install and configure Postfix so that it can be used to send emails by local applications only – that is, those installed on the same server that Postfix is installed on. If you're already using a third-party email provider for sending and receiving emails, you, of course, do not need to run your own mail server. However, if you manage a cloud server on which you have installed applications that need to send email notifications, running a local, send-only SMTP server is a good alternative to using a 3rd party email service provider or running a full-blown SMTP server. An example of an application that sends email notifications is OSSEC, which will send email alerts to any configured email address (see How To Install and Configure OSSEC Security Notifications on Ubuntu 14.04). Though OSSEC or any other application of its kind can use a third-party email provider's SMTP server to send email alerts, it can also use a local (send-only) SMTP server. 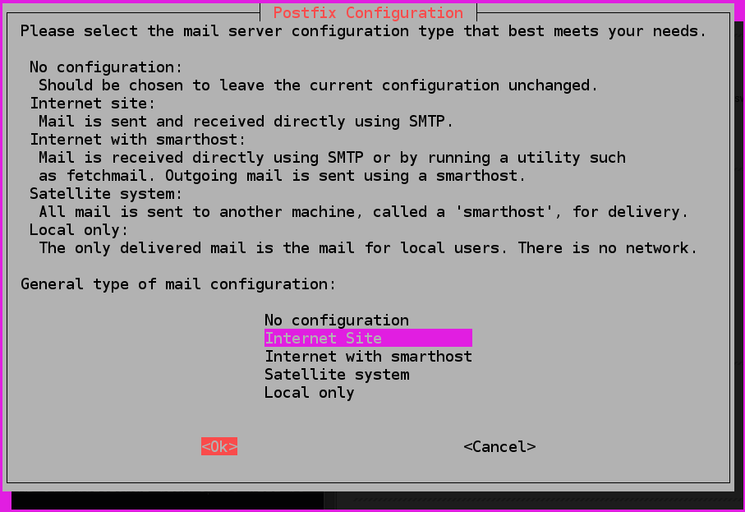 That's what you'll learn how to do in this tutorial: how to install and configure Postfix as a send-only SMTP server. Note: If your use case is to receive notifications from your server at a single address, emails being marked as spam is not a significant issue, since you can whitelist them. If your use case is to send emails to potential site users, such as confirmation emails for message board sign-ups, you should definitely do Step 5 so your server's emails are more likely to be seen as legitimate. If you're still having problems with your server's emails being marked as spam, you will need to do further troubleshooting on your own. Please complete the following prerequisites. If all the prerequisites have been met, you're now ready for the first step of this tutorial. Need to get 5,481 kB of archives. After this operation, 26.9 MB of additional disk space will be used. Press ENTER to install them. Near the end of the installation process, you will be presented with a window that looks exactly like the one in the image below. The default option is Internet Site. That's the recommended option for this tutorial, so press TAB, then ENTER. After that, you'll get another window just like the one in this next image. The System mail name should be the same as the name you assigned to the Droplet when you were creating it. If it shows a subdomain like mars.example.com, change it to just example.com. When you're done, Press TAB, then ENTER. After installation has completed successfully, proceed to Step 2. In this step, you'll read how to configure Postfix to process requests to send emails only from the server on which it is running, that is, from localhost. For that to happen, Postfix needs to be configured to listen only on the loopback interface, the virtual network interface that the server uses to communicate internally. To make the change, open the main Postfix configuration file using the nano editor. With the file open, scroll down until you see the entries shown in this code block. In this step, you'll read how to test whether Postfix can send emails to any external email account. You'll be using the mail command, which is part of the mailutils package that was installed in Step 1. In performing your own test(s), you may use the body and subject line text as-is, or change them to your liking. However, in place of user@example.com, use a valid email address, where the domain part can be gmail.com, fastmail.com, yahoo.com, or any other email service provider that you use. Now check the email address where you sent the test message. You should see the message in your inbox. If not, check your spam folder. Note: With this configuration, the address in the From field for the test emails you send will be sammy@example.com, where sammy is your Linux username and the domain part is the server's hostname. If you change your username, the From address will also change. The last thing we want to set up is forwarding, so that you'll get emails sent to root on the system at your personal, external email address. To configure Postfix so that system-generated emails will be sent to your email address, you need to edit the /etc/aliases file. In this step, you'll be given links to articles to help you protect your domain from being used for spamming. This is an optional but highly recommended step, because if configured correctly, this makes it difficult to send spam with an address that appears to originate from your domain. Doing these additional configuration steps will also make it more likely for common mail providers to see emails from your server as legitimate, rather than marking them as spam. Though the second article was written for Debian Wheezy, the same steps apply for Ubuntu 14.04.